Tuesday 26 Feb, Anguilla day 1: Departure St. Martin for Anguilla. But first a few things to do. Last night we noticed that the port authority over charged us a week for anchorage. It’s bad enough that they charge $40/week just to be at anchor, without charging an extra week! 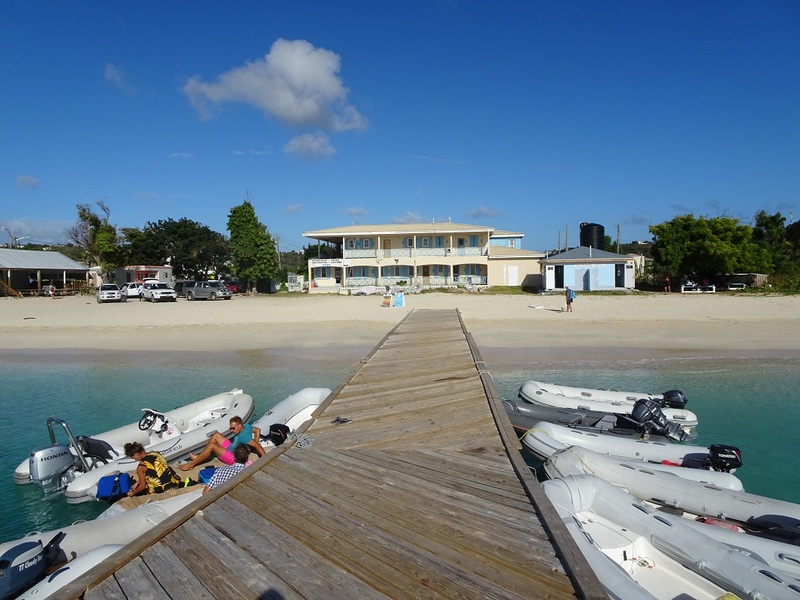 So before breakfast I head off for the long dinghy ride back over to Simpson Bay to get our money back! 40 minutes later I return, not happy. Apparently there is no daily rate, only a weekly rate and because we leave today, that puts us 1 day into the 5th week. So they are correct to charge us 5 weeks. Outrageous! It feels like the further north we get in this island chain the more the islands seem to fleece cruising yachts. Is it because we are getting closer to the USA?! After breakfast I do a bread run into Marigot while Oana stays on board. She’s really not in the mood to even move let alone the acrobatics of getting into the dinghy in this big swell and wind, and then get soaked on the dinghy ride. 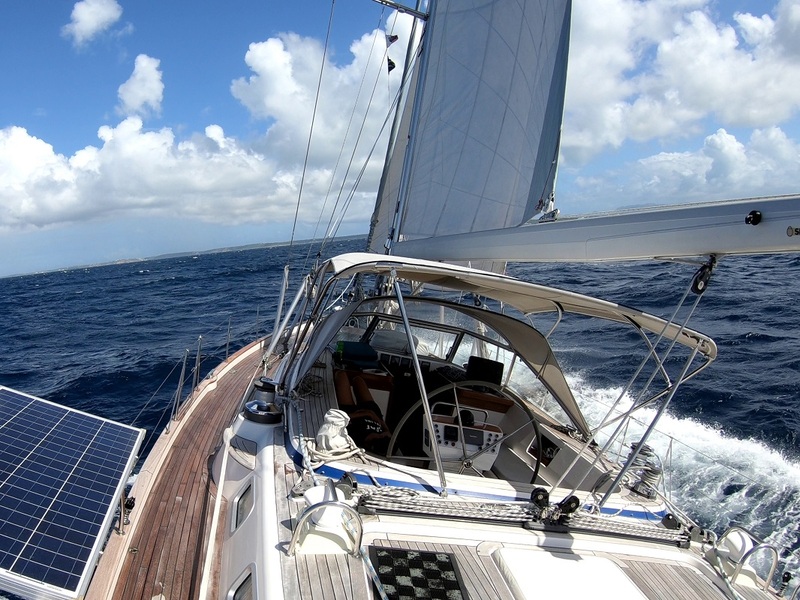 Once around the western tip we come hard on the wind (and waves) as we head upwind to our anchorage in Rode Bay. 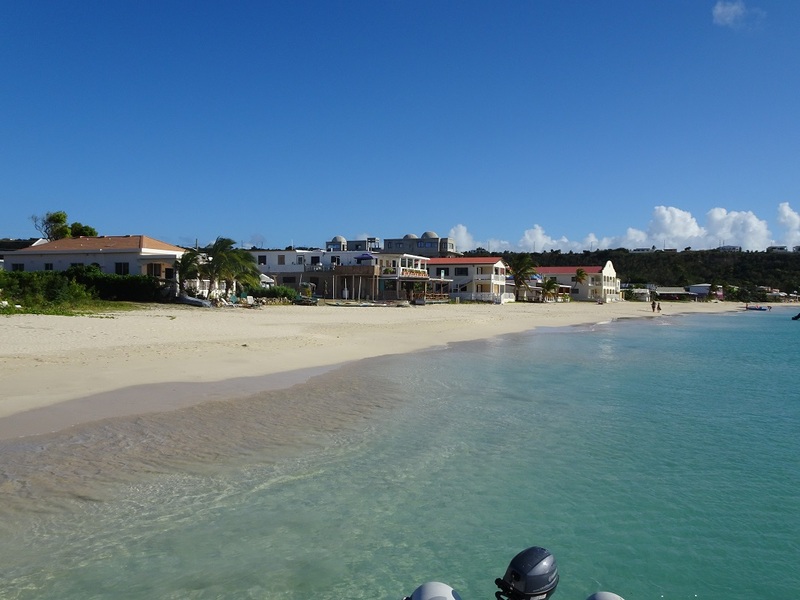 The only place we are allowed to anchor for the night on Anguilla and the only place to check-in. It takes two 4-mile tacks to get us the 5 miles up the western coast. The wind is constantly 20kts and often at 25kts (true wind) … meaning over 30kts across the deck (apparent wind). So it’s quite a wild sail with constant spray coming over the whole boat, right to the aft deck. And we wonder if Rode Bay can actually be more sheltered than Marigot Bay that we just came from. In theory it’s far more exposed to the swell. As we approach the bay we keenly look at the masts. They are swaying a little bit not too bad. There are probably 15 yachts anchored. We manage to anchor in a good position away from the swell and reasonably close to the shore, or as close as we can get considering the amount of local mooring buoys. Thankfully it is actually calmer than Marigot. It’s 3:15pm. So we rush ashore to check in before they close at 4pm. The Customs and Immigration is right there on the beach. Check-in is straight forward and only $19 harbour fees for 5 days. BUT, if we want to anchor anywhere else on the island or surrounding marine parks, we will be charged a whopping $140 per day! And even then, we would not be allowed to stay overnight in those places. So it’s a big “no thanks” to getting a marine park permit. We will be happy to explore the island by hire car, while remaining anchored right here in Rode Bay, thank you very much! After a late lunch we take a stroll along the beach which is very fine white sand. Almost like walking on powder. 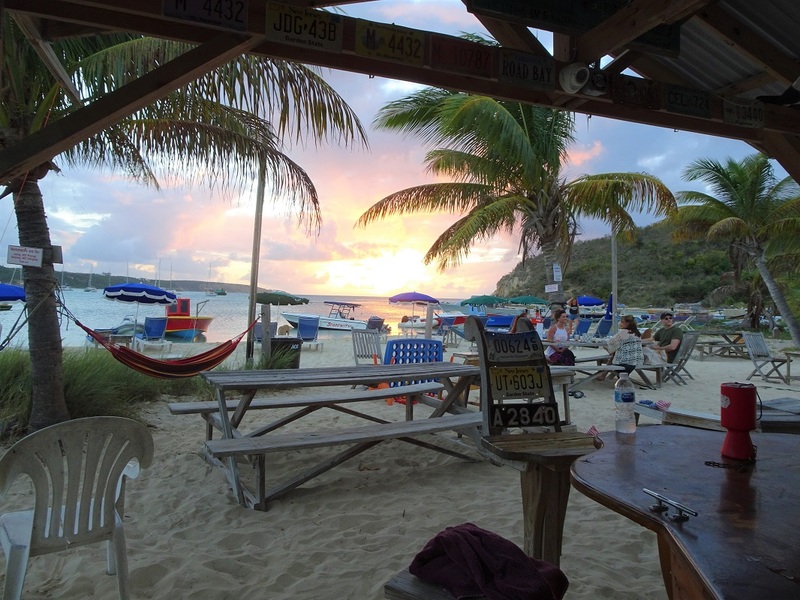 At the end of the bay we visit the Elvis beach bar for a sundowner. When we come to pay we are trying to decide if they are charging in US$ or EC$ (1US$=Ec$2.7). At $9 for a rum punch in a plastic glass, it would be cheap if EC$ and damned expensive if US$. Turns out it was US$. Oooph, that’s the most expensive rum punch ever! While walking the rest of the beach we check out menus at the various restaurants. Considering the prices, clearly we will only be eating on board Cloudy Bay while on this island. The catering prices seem to be very much set to all the American charter boats that make up more than 75% of the yachts here. Likely we won’t be seeing cheaper prices from now on, until we get beyond the BVIs, USVIs and Puerto Rico. We decide our next dining out treat will be in the Dominican Republic! We spend the rest of the evening on board, in a nice gentle breeze flowing through the boat and little swell for once. Long may it last. A peaceful night’s sleep for once. Hopefully! Yet another rental car broken!